The $80 (as of May 29, 2012) Canon Pixma MX372 color inkjet multifunction will meet the needs of anyone who prints or scans only a few pages a day. The unit offers a single-sided automatic document feeder for the scanner--surprising for a printer this inexpensive. It lacks an automatic duplexer, however, and it omits manual duplexing support on the Mac; its black-ink costs are high, too. Setting up and using the Pixma MX372 is easy, especially since you have only one choice in connectivity: USB. (If you need Wi-Fi, step up to the nearly identical, $100 Canon Pixma MX432, which also has a PictBridge port.) The Pixma MX372's control panel is plain, but competent. Tasks such as scanning to a PC require more steps with the two-line monochrome display than they do with a four-line or larger one, but the MX372's simple keypad and intuitive controls make it otherwise easy to use. Paper-handling features for the Pixma MX372 are rudimentary outside of the aforementioned 30-sheet ADF. A 100-sheet input tray sits at the bottom of the unit; paper exits directly above it, landing on the outer part of the input tray. You'll need to remove output to insert more paper, but that should occur rarely if you think ahead and keep the input tray well stocked. The lid of the Pixma MX372's A4/letter-size scanner telescopes to accommodate thicker materials. Canon doesn't shortchange the Pixma MX372 in the software department, bundling the same applications that accompany Canon's more expensive printers. The Solution Menu EX software allows access to common scan chores such as OCR, plus printer maintenance and relevant online destinations. Regrettably, manual duplexing support is missing from the OS X driver. The Pixma MX372's output is generally easy on the eye, though color graphics have the usual Canon orange cast. This coloring bestows a friendly vibe upon still-life and wildlife photos, but the effect on human faces is slightly comical. Text appears sharp and black, though the edges of letters are a tad soft if you look closely. Grayscale graphics have a slightly purple tinge, so Ansel Adams fans should look elsewhere. While not terrifically swift, the Pixma MX372 offers good performance for an $80 multifunction printer. Monochrome pages print at 5.9 pages per minute on the PC, and at 6.0 ppm on the Mac. Snapshot photos print at 2.4 ppm to plain paper, and at 1.2 ppm to glossy photo stock; on the latter, the MX372 is significantly faster than its MX432 cousin. A full-page photo takes about 3 minutes. Copies, generated at about 6.6 pages per minute, are very fast, even in comparison with the copy output of pricier MFPs. 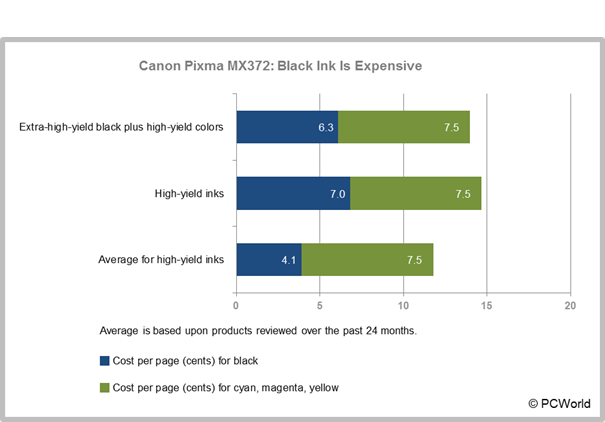 The Pixma MX372 has the same ink costs as other Canon printers that utilize the company's "240" and "241" cartridges. Put simply, black ink is very expensive, while color is decently cheap. The PG-240XL black cartridge costs $21 and lasts for 300 pages, working out to 7 cents per page. The $38, 600-page PG-240XXL, at 6.3 cents per page, isn't much cheaper. The $30, 400-page CL-241XL unified-color (three colors, one cartridge) replacement works out to 7.5 cents per page; that cartridge, added to the XXL black, makes for an affordable 13.8 cent four-color page. Caveat: When one color runs out, you must replace the unified cartridge, even though it may have plenty of one or both of the other colors. As a result, printing heavily with one color will alter your ink costs for the worse. The unit ships with 180-page starter cartridges. The Canon Pixma MX372 is a nice, basic, low-priced MFP for light use. For only $20 more, however, you can get considerably more features. Other $100 MFPs to consider are the Kodak Hero 3.1, with its wonderful photo prints, and the Epson Stylus NX430. The MX372 is a decent, inexpensive MFP for PC users, but its black ink is pricey, and it has no duplexing support for the Mac.